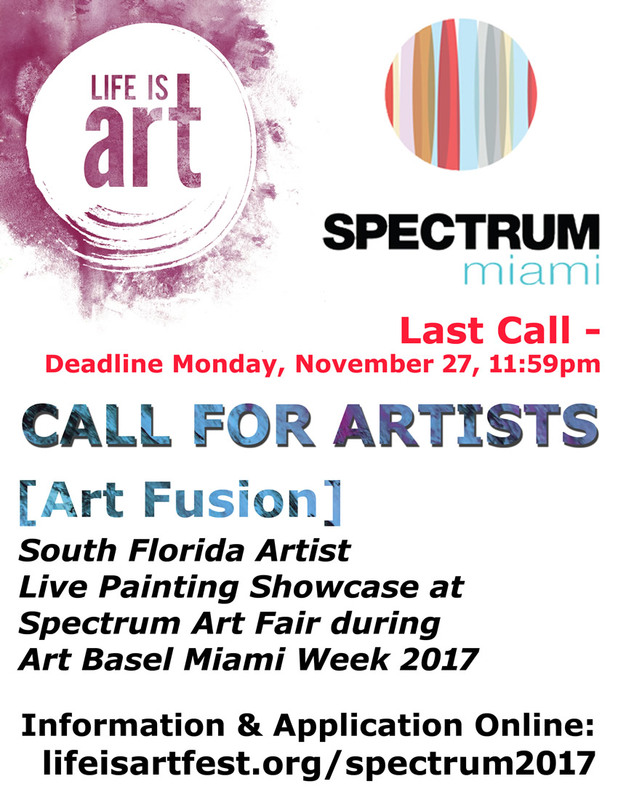 Life Is Art is once again working with our friends at Spectrum Miami Art Show to give South Florida Artists the opportunity to showcase their talent during the busy Art Basel Miami Art Week. This year we are hosting a Live Painting Showcase entitled [Art Fusion] throughout the run of Spectrum. Life Is Art will provide easels and lights. Artists need to provide all other necessary materials. Life Is Art and Spectrum take no commission to any art sold. Artist handles all transactions directly with buyer. To apply, fill out the form below. Be sure to include the times which you are available to work. If you commit to a time, make absolutely sure that you can fulfill it, no shows are unacceptable. We do not guarantee that you will receive all the slots which you have chosen, but we will not schedule you for a slot you have not chosen. We expect this opportunity to fill up quickly, so we recommend you apply right away. By applying to this Call for Artists, you signify understanding that you will be PAINTING LIVE during your time at the fair. Each artist will receive specific time slots during which they will be painting. This call is open to artists whose primary live or work location is within Palm Beach, Broward, and Miami-Dade counties. Deadline, Monday, November 27, 11:59pm. Application does not guarantee inclusion. Spaces are limited, so submit your application as soon as possible! This call is now closed. Thank you to everyone who applied. By agreeing to set up at Life Is Art, the above agrees to protect, keep and save Life Is Art and Spectrum/Redwood Media, and all their officers and staff, forever harmless from any damage, loss, cost, liability, or expense that arises from their being at this event. This agreement covers full setup, run of the event, and takedown. By signing above, you indicate your approval of all information contained. * I release Life Is Art, Spectrum, and promotional partners to use my name, image, and company information in the promotion of the event.